This book is about a boy called Joe, his mum and his best friend Ajay. Joe’s mum was the park warden and one day when Ajay came round for breakfast, some post came through the door saying… THE PARK WAS CLOSING DOWN! 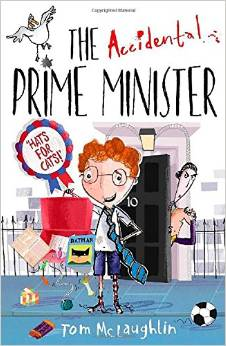 So when the Prime Minister came to Joe’s town, Joe gave him a piece of his mind as his mum was going to lose her job. However, the press recorded his whole argument and put it on TV and Joe became very famous; soooooooooooooooooooooooooooooooooooooooooooooooooooooooooo famous that the Prime Minister summoned him to Downing Street so he could be Prime Minister. “Little did he know that things would never be normal again.” When something like this happens, you always have someone who wants to take your place and in this case, it was evil Violetta, the Vice Prime Minister. Will Joe survive as Prime Minister? Or will Violetta (his nemesis & leader of the Anti-Silliness League) strive for victory? Will Jenkins (Joe’s secretary and second best friend) betray Joe and turn to the Anti-Silliness League? I recommend this book to 8+ readers because it has a few difficult words in it.